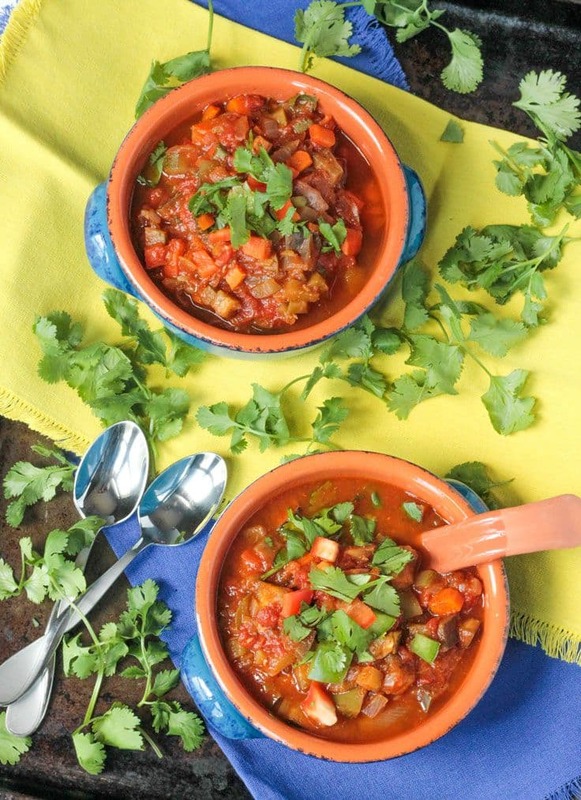 This Black Bean Butternut Squash Chili cooked in the slow cooker could not be easier! It’s perfect for any day of the week! I have made countless different versions of chili in my life. Being that I love the flavors of chili, I have liked nearly all of them. But, I always tend to fall back on my Pumpkin Lentil Chili. It is the perfect balance of spicy and sweet, creamy and chunky, veggie and beany (that’s a thing, right?). It has always been my favorite…..until now! This is a bold statement considering how much I love that pumpkin lentil goodness, but this Black Bean Butternut Squash Chili is now #1 in this house! It is also the perfect balance of everything and the fire roasted tomatoes really take it to the next level with all that smoky tomatoey deliciousness. Best yet is that it’s all done in the slow cooker making your life so much easier! Do you want to dive head first into that bowl? No? Maybe it’s just me. Go ahead and grab a big spoon and dig right in. Or grab a bag of tortilla chips and dunk away – this was the kids preferred way and, I must admit, mine too! Talk about perfect party food…I hear there is a big game this weekend. 😉 Set out all the toppings you can think of and let everyone customize their own bowl. Might I suggest a drizzle of Creamy Cumin Ranch on top of your Butternut Squash Chili? We tried it and it’s divine! For the kids, I stirred a little vegan sour cream into their bowls to help cool down the spice a bit. And of course, cool, creamy avocado on top helps too. They gobbled it right up. 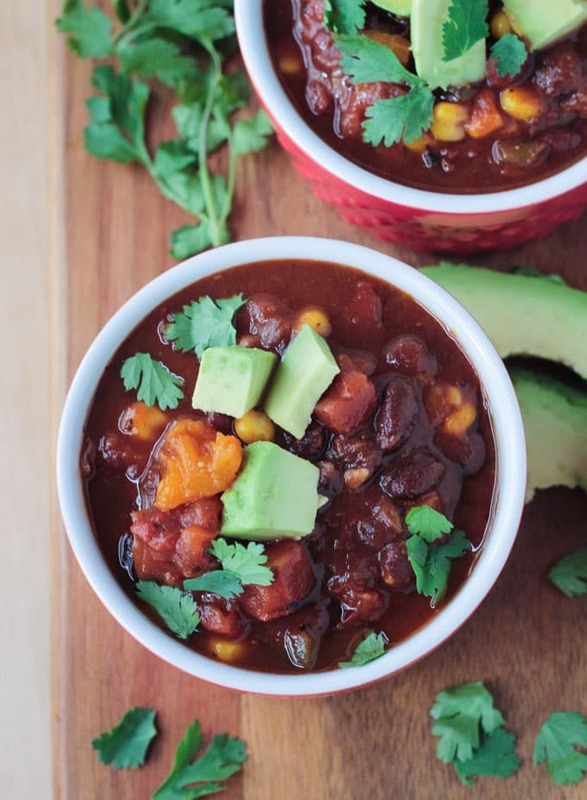 Please go make this Slow Cooker Black Bean Butternut Squash Chili soon and come back here to leave me a comment letting me know how easy and delicious it is! 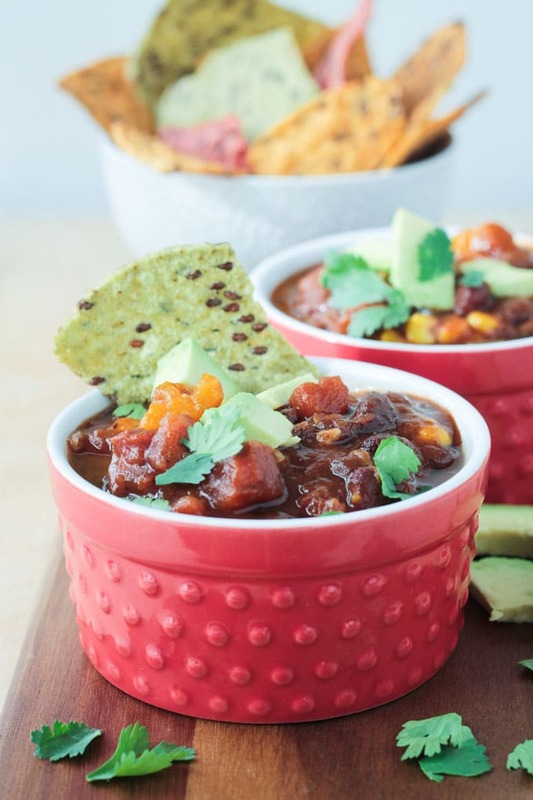 This hearty Black Bean Butternut Squash Chili is made in the slow cooker so it's the perfect meal for any night of the week. Make a big batch and enjoy it for game day or any other party too! 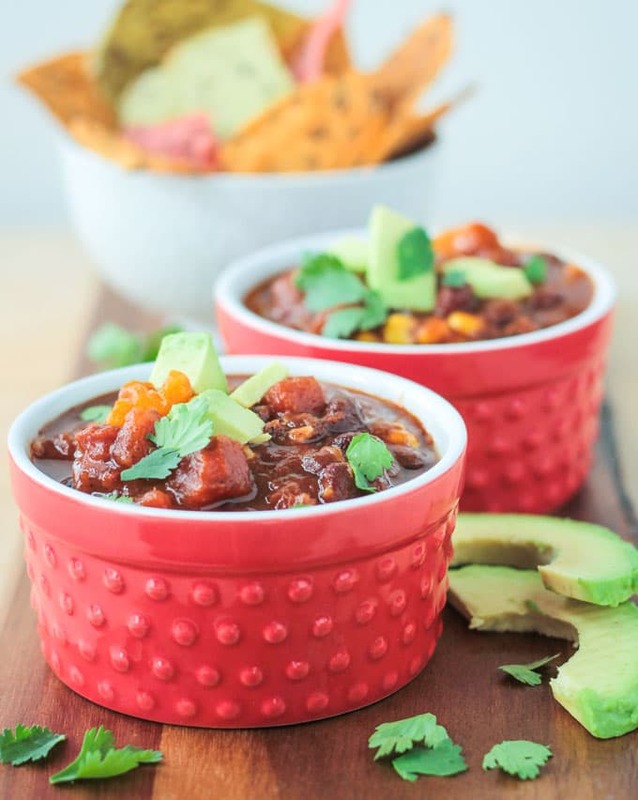 Super flavorful with a bit of spicy heat - it's become my new favorite chili recipe! Place all ingredients, except the corn, into a slow cooker and cook on high for 4-6 hours. Add the corn and cook for another 10 minutes to heat through. Serve with the toppings of your choice. The flavors get better the longer it sits. Leftovers are amazing, so make yourself a big batch and eat it all week! Excellent! Thanks, Siw! So happy you loved it! Do you drain the black beans prior to adding them to the soup? Typically the recipes call for that, but the soup looks so dark I wasn’t sure. Thanks! Hi, Amanda. Yes, rinse and drain them. Someone else just asked the same thing. I am adding it to the recipe now. Enjoy! This looks amazing! I am planning on making this tonight. One question – Did you rinse and drain the black beans before you put them into the slow cooker or did you just dump it all in? Hi, Sami! Yes, rinse and drain them. I will change the recipe to add that in…thanks for asking! Yup! With some recipes that is totally true! Gives the flavors time to mingle! my sister in law always serves butternut squash in her chili ( they dont eat beans in their house.) and it is always fantastic!!!! Now I want to make this. yum!!! Oh, that’s great! Please let me know if you try it! Thanks, Kristen! This looks so full of flavour and tasty! Yum!! Thanks, Sarah and Laura! I’m all for anything that makes life easier! And yes, avocado makes everything better! 🙂 Enjoy! Thanks, GiGi! I love it too! WE go thought a LOT of butternut squash! Really liking this combination, I often wonder what might make a satisfying veggie bean chilli and the butternut squash looks like it is it! Thanks, Kavey! I’ve got several chilis on the blog…all very hearty! But, yes, the butternut squash is great!! I’d just belly flop, but it would be worth it. I love chili too and love to experiment with different ingredients. This sounds perfect! Thanks Jenn. Belly flop is a good idea too! 🙂 Thanks, Linda! For sure! That’s really the best way! 🙂 Thanks, Natalie! 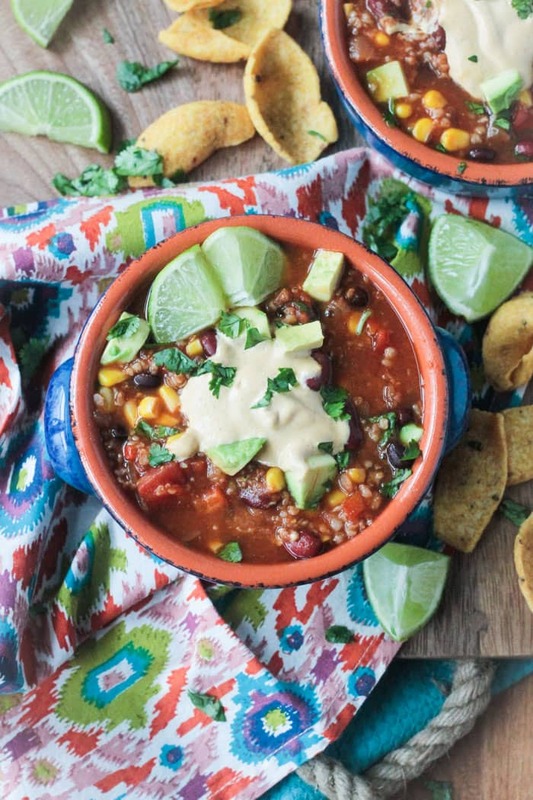 A drizzle (or pour) or ranch sounds quite lovely 😉 Mmmmm You can never go wrong with a bowl full of chili! The more beans and heartiness the better! Plus the bonus of the wondrous smell from the slow cooker!!! Totally! Love the way the house smells when you’ve had something cooking for hours. So cozy! Thanks, Rebecca!